KLKN Channel 8 joined us at our Wave of Light event held on October 15th, Pregnancy and Infant Loss Remembrance Day. View the event coverage here! Myranda Kennedy Photography also captured the event, showing what a beautiful and moving event the Wave of Light is. Enjoy the video below! 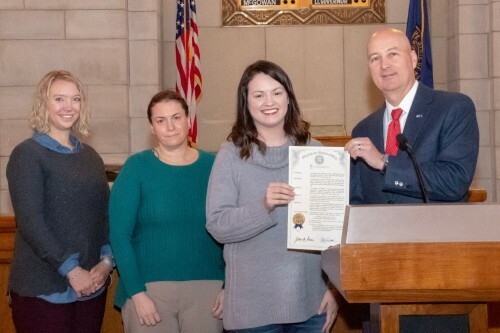 Pictured above from left to right is Erin Konecky, NFTS client and volunteer, Jennifer Eloge, NFTS board member, and Jolie Vega, NFTS founding Executive Director with Governor Pete Ricketts. During the October 15th proclamation ceremony, Governor Pete Ricketts acknowledged the month of October as Pregnancy and Infant Loss Awareness Month, as President Ronald Reagan first did in 1988. Jolie Vega of No Footprint Too Small has the opportunity to speak with Cindy Lange-Kubick of the Lincoln Journal Star about No Footprint Too Small. 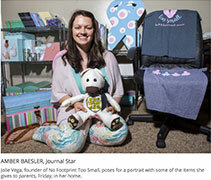 The recently established No Footprint Too Small Birth and Bereavement Services is holding a fundraiser. The nonprofit's mission focuses on providing support for mothers and families who have experienced pregnancy and/or infant loss. When a baby dies, a parent’s grief runs deep. This kind of grief saps the parent’s physical and emotional strength. Especially during the first year, many parents doubt they can survive this experience. Their devastation feels too all-encompassing, coloring everything around them. The trauma makes it difficult to imagine ever healing. Ever. When a baby dies, most grieving parents struggle with feelings of guilt. If you are a bereaved parent, you likely know this emotion well. At times, guilt can feel like a flood that threatens to sweep you under. Practicing good mental health means not exposing yourself to the horrifying details. Still, it’s disconcerting when it’s hard to imagine that you—or anyone else—could ever be able to pick up the pieces when life is shattered by such tragedy.